Western Wisconsin Health provides safe, convenient, high-quality surgical services for patients of all ages, including children over six months old. The surgical providers include Dr. Peter Dahlberg, General and Thoracic Surgeon, Dr. Mark Romzek, Orthopedic Surgeon, and Dr. Dennis Hartung, OB-GYN. We also have partnerships with specialty providers to bring expert surgical specialty services to the community. 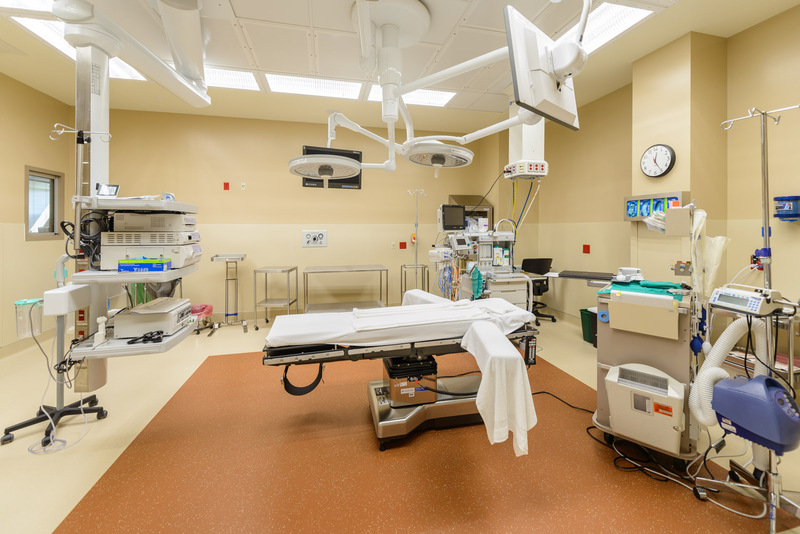 The new surgical services department has private pre-op rooms, two state-of-the-art operating suites, a designated c-birth room, a gastroenterology suite, and private post-surgical recovery bays with windows to bring in natural sunlight and a comforting view of the prairie. Our full-time General and Thoracic Surgeon, Peter Dahlberg, MD, Phd, has a special interest in surgical oncology including breast, colon, lung and skin cancer. He has worked at the Virginia Piper Breast Centers at both Abbott Northwestern and United Hospitals. His current practice includes a broad array of endoscopic, traditional and minimally invasive procedures for cancers, hernias, wounds, gallbladder disease, stomach problems, colon and rectal disease, and thyroid problems. He is a board certified in both general and thoracic surgery and a member of several surgical societies. Dr. Dahlberg is also available for emergency surgeries after business hours. Our full-time Orthopedic Surgeon, Dr. Mark Romzek, specializes in advanced orthopedic surgery techniques designed for fast and complete recovery in patients of all lifestyles. Our full-time OB-GYN Physician, Dr. Dennis Hartung, provides advanced gynecology surgery. He specializes in laparoscopic and minimally invasive surgeries for women to treat a wide range of women’s health issues. You will meet with your primary doctor or the surgeon to complete a physical to make sure you are healthy enough to undergo surgery and anesthesia. If you have diabetes, please ask your provider for specific instructions about your diabetic medications on your surgery day. If your primary physician is at another facility, please have them fax the completed paperwork to us at 715-684-1349. Aspirin, ibuprofen (such as Motrin, Nuprin or Advil), Coumadin, and other medications may cause excessive bleeding. Ask your doctor if you should stop taking these drugs or other medicines before your surgery. You must have someone drive you to the facility and pick you up after your surgery. You may also need extra help when you get home. Plan for this ahead of time. If you are having outpatient surgery, you must have a family member or friend with you after surgery to review your instructions, drive you home, and stay with you for 24 hours after your procedure. If you develop a fever, cold or rash, or suspect that you are pregnant, please inform your surgeon and/or contact us at 715-684-8684. It may be necessary to postpone your surgery. Contact your insurance company to make sure you are approved and covered for surgery. Make sure you understand your coverage. Any co-pays or percentages not covered by insurance will be your responsibility. You may be asked to provide partial payment for your surgery before it can be scheduled. Remove nail polish and jewelry prior to surgery. Do not shave your surgical site for at least one week prior to surgery. Stop smoking as soon as you can before surgery. It is important that you not smoke at least the evening before and the morning of surgery. Your lungs will work better and your blood stream will improve, helping you heal more quickly. An event like surgery is a great time to quit smoking permanently. We will call you 2-3 days prior to surgery to let you know what time you should arrive for your procedure. Please do not eat or drink anything for 8 hours before your scheduled arrival time. This includes gum, mints, coffee and water. Babies and people with diabetes may receive special instructions tailored to their individual needs. Please bathe or shower with an antibacterial soap, either the night before or the morning of surgery. Do not apply lotions, creams, powders or deodorant after bathing. When coming for surgery, please enter through the emergency department entrance. Please check-in at the reception desk. Our staff will keep friends and family members informed throughout their visit. Family-friendly waiting areas are available for visitors. Please wear comfortable and loose clothing that will be easy to put on and take off. Please do not wear any makeup, jewelry or fingernail polish. Bring all insurance cards, picture ID and any credit cards needed for payment with you on the day of surgery. Remember not to eat or drink anything for 8 hours before your scheduled arrival time. Bring a complete list of your medications including: name, dose, and reason you take it. Surgeries can last from 30 minutes to several hours. We provide several amenities to help make your wait time pass more quickly. After your surgical procedure, you will be taken to the recovery room where you will be under observation until you are awake and prepared for discharge or brought to your hospital room to continue recovery. When you return home, you should follow your physician’s instructions on diet, activity, and medications. It is common to feel dizzy or sleepy for several hours and you should feel more like yourself in 24-48 hours. It is suggested that you rest the remainder of the day and do not drink alcoholic beverages for the rest of the day or night. We also recommend that you do not operate any motor vehicles or heavy machinery for 24 hours. If you have any questions or are concerned about your progress, you should not hesitate to contact your physician. If you are unable to locate your physician, please feel free to contact the surgical services department for assistance at 715-684-1313. At Western Wisconsin Health, our goal is to give you the best possible medical care. We are committed to meeting and preferably exceeding your expectations. 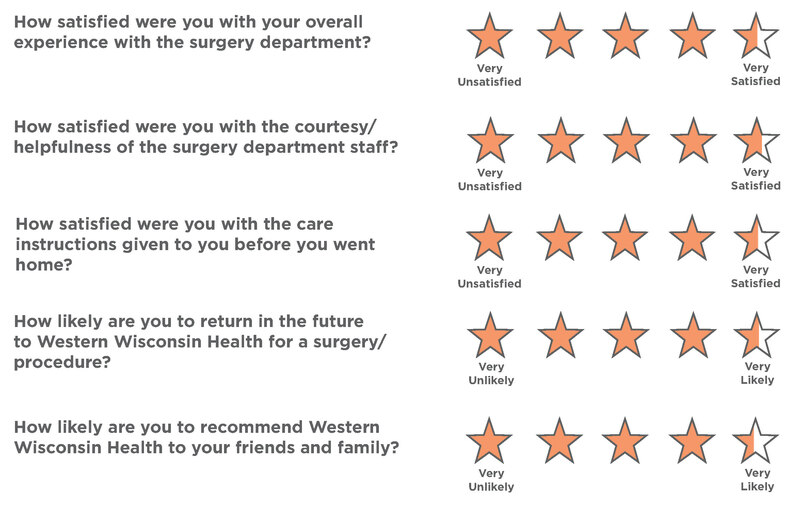 Below you can see how 197 surveyed patients rate the surgery department and the services they provide.